It's glam nation at the aforementioned awards nights. Featured scanned photos from StarStudio Magazine include: Box Office Queen Anne Curtis, Female Concert Performer of the Year Toni Gonzaga, Princess of Philippine Television Kim Chiu, Erich Gonzales, Film Actress of the Year for In the Name of Love Angel Locsin, Box Office Queen Cristine Reyes and Jewel Mische. It's Metro Magazine's fashion for a reason. Held at the EDSA Shangri-la Hotel for the benefit of Sagip Kapamilya projects. 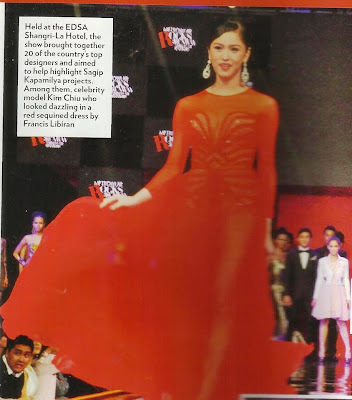 Featured scanned photos from StarStudio Magazine include Kim Chiu, Maja Salvador, and event host Joey Mead-King. I can't resist it when I see celebrities donning lovely gowns. Here I came upon the latest Yes! Magazine feature on some of the brightest stars of this generation. It's a good thing we've got a scanner so I can share the magazine pics here. I love their nice dresses too! Not as formal as the lovely gowns, but just as lovely! *If you have pictures of your favorite celebrities that you want featured here, feel free to leave me a message on my twitter account or my facebook page. Bianca had her costume change as well!